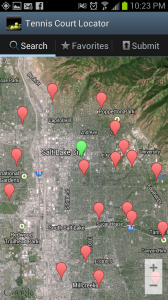 Find nearest courts to your location. See an overhead satellite image centered right above the tennis courts. 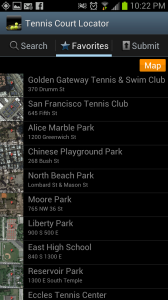 Add courts to your favorites for easy retrieval. Narrow your search to find grass, hard, clay, lights etc.. Easily submit new tennis court. 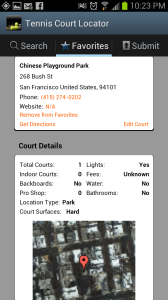 New courts are submitted daily. Edit Court Listing to help us keep them up to date.